What makes a great sausage? 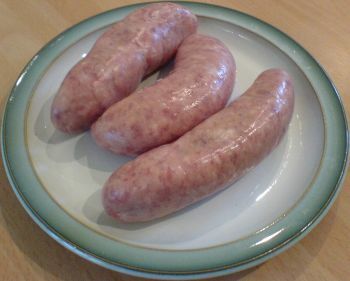 Bradford-on-Avon sausage maker William Browne of the Old Spot Sausage Company talks about what makes a great sausage. William Browne knows his bangers. The 27-year-old recently launched the Old Spot Sausage Company in Bradford on Avon producing handmade sausages which are sold online and at local markets. Having studied Countryside Management at college the young entrepreneur went on to work at farm shops in the area where he qualified as a butcher. But it was a spell working at Bath’s sadly now defunct sausage shop on Green Street which inspired his love of the humble banger. “It all sparked from my time working at the Sausage Shop,” said William. “Then when I was working at the Hartley Farm Shop we won two silver awards from Taste of the West for the sausages. Since launching the Old Spot Sausage Company in February it has been a steep learning curve for William. But now William is producing around 2,000 sausages every week, every one of which he makes himself, by hand. And it’s the love and attention that William puts into the process that he says makes his sausages stand out from the rest. “Most supermarket sausages are made by machine and have probably never been touched by a human,” he said. “And I think you can tell. They also tend to use collagen casing rather than the traditional intestines and that affects the taste and the way that they look. And it’s bad news for those watching their waistlines because according to William it’s the fat that can make all the difference. William buys whole pigs and butchers them himself. “I use the whole pig, not just specific cuts,” he said. “There’s actually some really good meat on the head of a pig, like the cheeks and the bit behind the jaw. William can produce around 1,000 sausages from a single pig and he doesn’t only make traditional pork sausages – although they say that they are his best seller. He also experiments with other flavours and regularly produces speciality varieties such as Toulouse, hickory barbecue and even a Ploughman’s variety. As a small business owner himself William is passionate about supporting local farmers. “I buy all the pigs from local farmers. For some reason it’s actually cheaper to buy in meat from the continent than to buy British though, which seems crazy to me. “One thing I pride myself on is paying a fair price to the farmers. They have to make a living, too. Full story from Bath Chronicle.